The seam closer is designed for easily and quickly closing seam folded tubes fitted with a double seam. The closure is of a high quality. The machine has a variable working speed, and roll-pressures applied pneumatically. 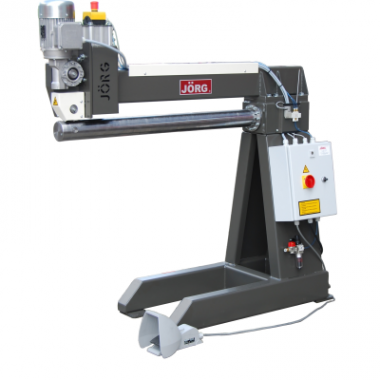 This machine is entirely designed by Jörg and produced in the Netherlands and is especially strong and carefully constructed to allow years of pleasant and productive work. Up to 1 mm of St 37 can be processed. The foot pedal is used to clamp, process and tightly seal the tube. Application includes the air duct industry, exhaust gas ducts, and insulation. By feeding the tube from both sides, pipes up to twice the machine’s capacity can be processed.